Like it or not, milk is a staple of the American diet and, more than any other food, milk has become a symbol of wholesome goodness and pastoral purity. With all the forces of Madison Avenue arrayed against them, how can milk's dissenters take on "nature's perfect food?" 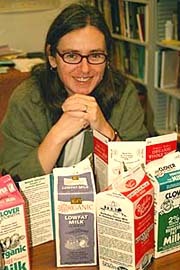 "For years, milk has been championed as the perfect food, and now it is being demonized as a symbol of the degradation of modern society," said E. Melanie DuPuis, an assistant professor of sociology at UCSC and author of the new book Nature's Perfect Food: How Milk Became America's Drink (New York University Press, 2002). "The fact is that we need to get beyond the idea that milk is either perfect or it's poison." By the late 1800s, social activists focused on public health and sanitation, calling for the pasteurization of milk and the inspection of dairy farms as part of their vision of a perfect society. Progressive-era reformers sought efficient, large-scale milk production on intensive dairies and a state-of-the-art transportation system to link rural dairies with populous urban areas. The demand for milk soared during World War I (condensed milk was used to fight malnutrition among European conscripts), and American milk drinking rose steadily until World War II, except during the Depression when consumption fell dramatically, triggering strikes that contributed to milk-related New Deal legislation. Today, Americans drink less fluid milk but eat increasingly larger amounts of manufactured milk products like cheese and ice cream.